A database D may be inconsistent wrt a given set IC of integrity constraints. 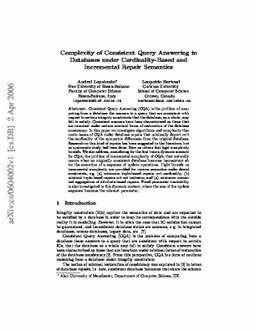 Consistent Query Answering (CQA) is the problem of computing from D the answers to a query that are consistent wrt IC. Consistent answers are invariant under all the repairs of D, i.e. the consistent instances that minimally depart from D. Three classes of repair have been considered in the literature: those that minimize set-theoretically the set of tuples in the symmetric difference; those that minimize the changes of attribute values, and those that minimize the cardinality of the set of tuples in the symmetric difference. The latter class has not been systematically investigated. In this paper we obtain algorithmic and complexity theoretic results for CQA under this cardinality-based repair semantics. We do this in the usual, static setting, but also in a dynamic framework where a consistent database is affected by a sequence of updates, which may make it inconsistent. We also establish comparative results with the other two kinds of repairs in the dynamic case.